Timeline — R.K. Laros Foundation Inc.
R.K. Laros is born to Alvin and Eliza Laros. They lived in Easton, PA where Alvin was a carpenter by trade. R.K. graduates from Lafayette College. While attending he served as the chapel organist, was a part of the musical club, and a member of the Omega Delta Phi fraternity. During this time R.K. works for the N.Y. Standard Oil Company, the Lehigh Valley Light and Power Company, the Public Services of New Jersey, and lastly, at H.N. Crowder Jr. Company. The first R.K. Laros Silk Plant is established in Miller Heights. R.K. is elected as a trustee of St. Lukes Hospital and served until his passing. R.K. becomes the President of the Bethlehem Chamber of Commerce. The Dimensional Slip is released which is capable of fitting all nine basic body types because of its uniquely cut design. R.K. begins to manufacture parachutes in order to help the war effort. The majority of parachutes produced are fragmentation bomb parachutes. R.K. passes away at Sunset Acres. 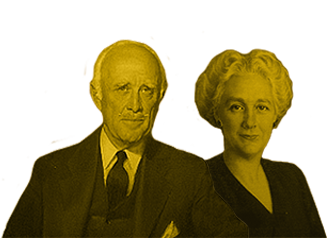 ￼The R.K. Laros Foundation has served over 150 community non-profit organizations honoring the original Foundation Charter and the intentions of the founders R.K. and Helen Laros. Today R.K. Laros III serves as Foundation Chair, carrying on the legacy of his grandfather and father, R.K. Laros and R.K. Laros Jr.